Robbery is one of the most common legal errors of all time. It seems that, any time property is taken from a person, that person believes they have been “robbed!”; however, that is not the case. 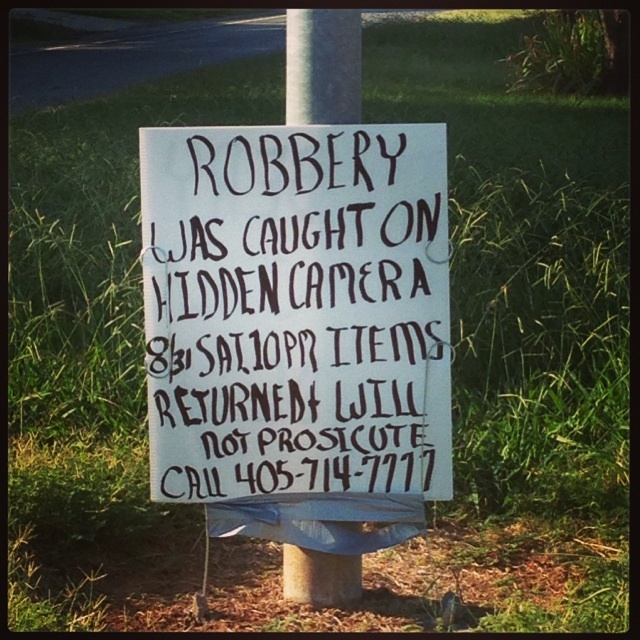 Some situations may only amount to theft. Others may amount to burglary. Only some instances are actual cases of robbery. Regardless of the charges you face, it's crucial that you hire an experienced attorney to help ensure you are protected before the law. If you or someone you love is facing charges of robbery contact a lawyer at the Law Offices of Adam R. Banner, P.C. for a free case evaluation. In Oklahoma, robbery is not the same as burglary; in a sense, robbery is theft from a person, and burglary is theft from a home. Specifically, robbery is defined in Oklahoma as follows: robbery is a wrongful taking of personal property in the possession of another, from his person or immediate presence and against his will, accomplished by means of force or fear. So, in the example of the image above, the fact that the “robbery” was caught on hidden camera gives off the inference that no person actually saw it. If no person actually saw it, then it could not have been a situation in which property was taken from the person or their immediate presence through force or fear…otherwise, you’d likely have an eyewitness-account of the robber. Furthermore, to constitute robbery, the force or fear must be employed either to obtain or retain possession of the property or to prevent or overcome resistance to the taking. If employed merely as a means of escape, it does not constitute robbery. Moreover, the value of the items taken does not matter so long as the wrongful taking is effectuated through the use of force or fear. In this sense, even if a person were to “rob” someone of a worthless pen or pencil, the crime of robbery would still be committed so long as the force or fear element was met. Robbery is divided into first and second degrees. Robbery in the first degree consists of cases in which—while in the process of taking the property of another person by means of force or fear—the perpetrator either inflicts serious bodily injury, threatens a person with immediate serious bodily injury, intentionally puts someone in fear of immediate serious bodily injury, or commits or threatens to commit an additional felony upon the victim. 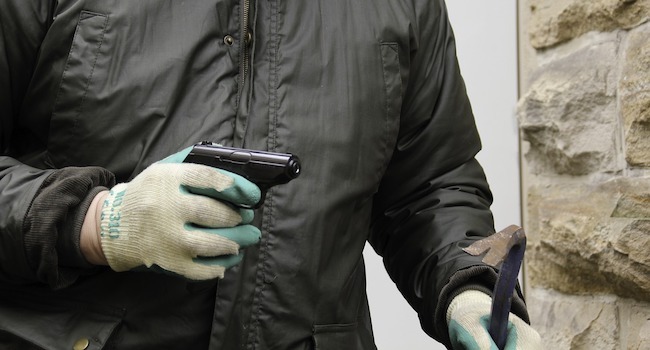 Robbery in the second degree, however, occurs when none of the above conditions necessary for first-degree robbery occur, yet there is still a taking of property from another person through the use of force or fear. Robbery in the first and second degree can be accomplished without a firearm; however, as with most other crimes, the stakes are raised when a dangerous weapon or even an imitation firearm is used to effectuate the commission of the crime. In Oklahoma, if the robbery is accomplished through the use of a firearm or other dangerous weapon, the potential punishment allowed under law is a mandatory prison sentence of at least ten (10) years up to and including life in prison. For purposes of “armed robbery” as the crime is often referred to, it does not matter if the gun is loaded or unloaded. It also does not matter if the gun is loaded with blanks or if it is even a real firearm. So long as the weapon is capable of raising in the mind of the victim the possibility that the firearm is real, the perpetrator will likely face armed robbery charges. Due to the inherently violent nature of the crime, robbery carries a heaven punishment range with a stiff mandatory minimum sentence. Moreover, robbery is an 85% crime, which means that anyone convicted is required to serve at least 85% of the sentence imposed prior to becoming eligible for parole or earned credits that can greatly lower the amount of time an inmate will spend in prison prior to discharging a sentence. Any person guilty of robbery in the first degree shall be guilty of a felony. They will face a potential prison sentence of ten (10) years to life incarceration. Any person guilty of robbery in the second degree shall be guilty of a felony as well. Those convicted of second-degree robbery will face imprisonment in the State Penitentiary not exceeding ten (10) years. To protect your future and your freedom it's important to talk to a qualified attorney if you're facing charges. Contact the Law Offices of Adam R. Banner for a free case evaluation.